A Phone with the largest Screen to Body ratio. Vivo is known for offering decent flagship devices with power-packed internals for the price which is half of the existing Apple flagships cost. It is always known for copying iPhones but the recent times proves that to be wrong. Vivo is changing from copying to the path of innovation which is great. X21 Vivo, Vivo Apex, Vivo Nex S are perfect examples. Vivo is proving to be a potential threat to the bigger guns in the industry like Xiaomi, Samsung, Apple. Vivo Nex S is released in June 2018 in a launch event in China. This device features a beautiful 19:9 1080 pixels by 2316 pixels display panel with the pixel density of ~338. Vivo Nex S has the largest screen to body ratio of 91.24%. It is one of the best display in the market which is by the way made by Samsung. Yes, it is notch free and implements some weird, yet an intelligent moving mechanism to feature the front-facing camera. Vivo Nex S has no IR face ID like iPhone X but has its own in-display Fingerprint scanner which is a game changer. The Fingerprint scanner is not as fast as the other Flagships devices like OnePlus 6, but it is decently fast and surprisingly accurate, in fact, that is what makes it stand out from the competition. Vivo Nex S features a powerful 2.2GHz octa-core Qualcomm Snapdragon 710 chip under the hood. This device comes with whooping 6GB of RAM and 128GB of Internal storage. So this should handle anything you through at it with ease. There is no expandable storage. Vivo Nex S still keeps a 3.5mm headphone jack which is great for some users. 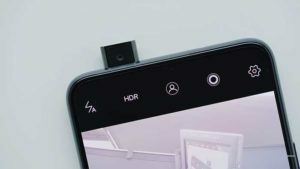 Vivo Nex S has a dual 12 MP, 5 MP cameras on the rear and 8 MP front camera for selfies. The rear cameras are capable of shooting at 4K 30 fps and portrait shots. The front camera uses a pop-up mechanism to pop out and capture selfies. Vivo Nex S runs on Android Oreo 8.1 and is powered by 4000mAh non-removable battery. Since it packs the power efficient Snapdragon 710, it lasts a complete day. Vivo Nex S is a dual SIM (GSM and GSM) smartphone that accepts Nano-SIM and Nano-SIM. Connectivity options include Wi-Fi, GPS, Bluetooth, NFC, USB OTG, 3G and 4G (with support for Band 40 used by some LTE networks in India). Sensors on the phone include Compass/ Magnetometer, Proximity sensor, Accelerometer, Ambient light sensor and Gyroscope. The price of this device in the US is expected to be around 700 USD (600EUR). As of now, the price of Vivo NEX in India is nearly Rs 40,000 for the base Snapdragon 710 SoC option. OnePlus 6, a real flagship killer ?